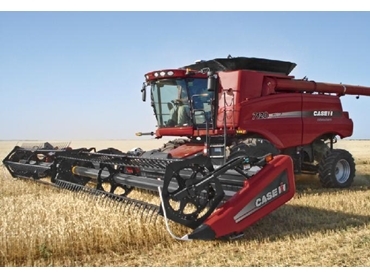 Case IH’s new Axial-Flow combines boast new technology, a new look and a diverse six-model range which ensures the right sized machine for every operation. The range, launched globally this week, includes the 88 Series and the 20 Series, each with three models. The 88 Series includes the Axial-Flow 5088 and 6088, which replace Case IH’s Axial-Flow 2577 and 2588 machines, as well as the completely new 7088 model. In the 20 Series, the 7120 and 8120 replace the Axial-Flow 7010 and 8010, while the 9120 is a new model – and also the largest single rotor combine offered in the industry. The new range has been developed from the ground up to deliver the latest technology and innovations. “We’ve redeveloped the chassis, the engine, the drive system, the axle: this is not a skin-deep makeover. The 88 series machines are a completely new design and all of the models in both the 88 and 20 series are B100 approved, which means they can be run on up to 100 per cent biodiesel. While the machines deliver a host of new features and the latest technology, they’re still built around the core principles that have provided Australian farmers and contractors with excellent grain samples and low running costs for over 30 years. “The key to the Axial-Flow combine has always been a single rotor that threshes, separates, and creates a vacuum of air that helps provide a clean operating environment. The single, in-line rotor offers gentle, crop-on-crop threshing that results in more whole kernels, fewer cracked grains and substantially less foreign material in the sample,” Geoff says. Design changes to the 88 Series include a 15 per cent increase in the clean grain elevator capacity and the 6088 and 7088 have a larger rotor belt drive to handle the higher crop throughput. All three models come with standard in-cab sieve adjustment and Terrain Tracker offering lateral tilt of up to five degrees. The three models also feature automatic crop settings and come standard with the Case IH AFS Pro 600 monitor providing machine performance and guidance (if equipped) on one single, easy to operate touch screen. The 5088 and 6088 models are powered by an 8.3L CDC engine; while the 7088 is powered by a 9.0L CDC engine. Unload rates have increased to 106 litres (three bushels) per second on the 6088 and 7088 and quick-folding grain tank extensions are standard. “When you fold down the extensions, the auger folds down, too, for easy transport and storage,” Geoff says. The 5088 features a 6.4 m (21 foot) unloading auger, while the 6088 and 7088 have a standard 7.3m (24 foot) unloading auger. The new 88 Series also includes a longer wheel base and enlarged front axle tube. “The new longer wheelbase allows operation of wider heads without requiring rear ballast and also allows for larger rear tyre equipment which reduces ground compaction,” Geoff says. The 5088 and 6088 are designed for customers who want excellent productivity from a mid-range capacity machine, with new styling, controls and instrumentation. The 7088 is perfect for growers and contractors who require more productivity from a standard, mid-sized machine. All Case IH Axial-Flow 20 Series combines feature power rise for whenever crop conditions demand it, and the 7120 model features power rise and power boost for unloading on-the-go. “We can generate a remarkable 43 HP rise on the new 9120,” says Geoff. Grain tanks on the 7120, 8120 and 9120 models are equipped with quick-folding bubble-up auger and grain tank extensions. A 7.3 m (24 foot) unloading auger is standard on all three models and is capable of unloading at 113 l/sec. All models in the 20 Series are powered by Case IH engines, matched to suit power demands. The 7120 features an 8.9 litre engine, the 8120 is powered by a 10.3 litre engine and a proven 12.9 litre unit powers the all-new 9120. These engines are common with other products in the Case IH line, simplifying parts stocking and making the most of dealer technician training.